Neutronics BioPak 240R — Brownlie Design, Inc.
Brownlie Design partnered with Neutronics/Biomarine to design the revolutionary Biopak 240R four-hour rebreather. 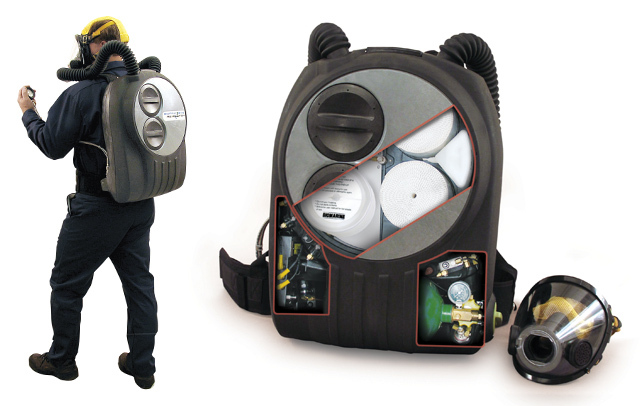 Biopak is a closed circuit, self contained breathing apparatus used for mine/tunnel rescue, hazmat remediation, fire service, military and government, urban search and rescue, law enforcement and other applications requiring prolonged activity in hazardous atmospheres. The enclosure was developed to be rugged, ergonomic,and light weight, with quick, toolless service access. Unit cooling can be replenished on the fly without interrupting the breathing loop or opening the unit. A stainless steel fiber-reinforced polymer was chosen for durability and electromagnetic immunity. It incorporates a slim profile and fully padded harness. Controls and displays are ergonomically positioned for easy accessibility. The Biopak 240R was developed to provide best in class performance, faster deployment, exceptional comfort, maximum reliability and low operating costs.